Have I ever mentioned that I love my muffin tins!!? I think I’ve probably made muffins in them twice but we use them at least once a week. They’re great for separating out ingredients or art supplies for creative activities. We also use them for sorting objects by colour or type. When Eli was younger he like to move objects from one section to another. And we love muffin tin meals. Eli has always eaten really well so it’s easy to be lazy with his meals because I don’t need to make them interesting to encourage him to eat. He does love these though and it really is no different than what I would have given him anyway. Today we didn’t have a big selection of food in the house. He had cheese (cubed and grated) toast, apple slices and a box of raisons. 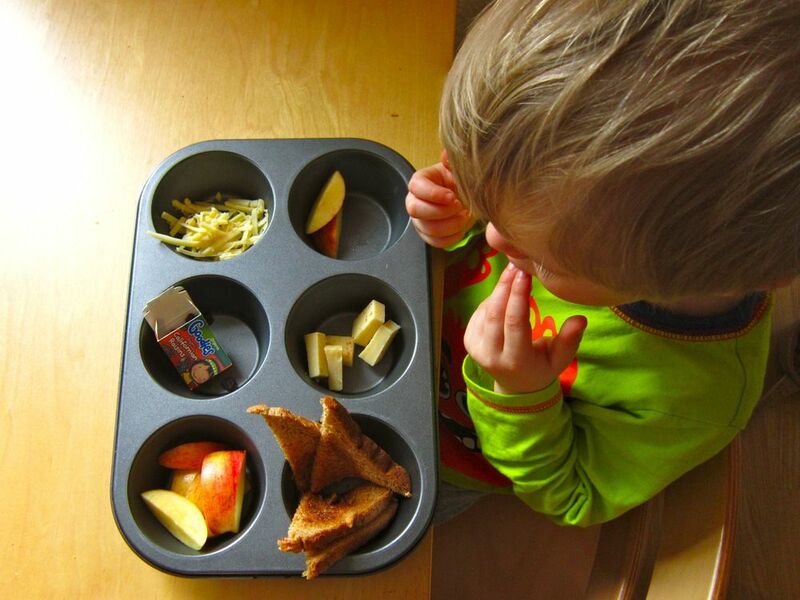 The advantage of serving it like this is so he can be in control of what order he eats his food in (3 year olds love control) and it looks like fun! Well I enjoy reading it. Yes, thus far Ted hasn’t been overly fussy, there are a few random things he doesn’t like, so I just keep trying him with them (when I remember). But even though he’s fine, I’ve been surprised how emotional the issue of eating is, can feel desperate if it doesn’t seem as though he’s eating enough/ or enough ‘good’ stuff, so yes, sure if I had a really picky eater I’d try anything. Oh I know exactly what you mean. Eli sometimes goes through a few days of eating very little – usually when he’s about to come down with something – and it’s really hard to be relaxed and trust him about it. Yes, good observations, there is usually a very good reason for ted not eating that he just can’t vocalise and I’m not the best at remembering / accepting that. (Matt jokes our baby led approach has been replaced by calorie led).